I have been enjoying the wildflower themed posts by participants in Elizabeth Joy's Wildflower Morning anticipating spring round-up! Fellow bloggers have been busy posting photos and prose as assigned in the weekly wildflower themes. This week's assignment is: Literary Wildflowers - Stories, quotations or poetry about wildflowers written by you or someone else. Or write a book review about a book that features wildflowers, such a guide book, picture book, travel guide or something about wildflower gardening, etc. Or write about some special places/trails/areas to go searching for wildflowers that you are familiar with. Tell about the best time of year to go there, and what you might see. Share photographs if you have them. If you'd enjoy reading what other bloggers are posting, you can find help from Mr. Linky on Elizabeth Joy's blog or find a list of links at the right of this page. 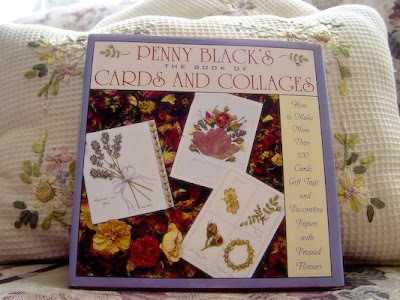 I love Penny Black's books ! I did not even know about this one! What wonderful, beautiful flower work you do !! This is a great way to preserve and share flowers. Do you find the dried flowers keep their colour or do they fade to brown? Do you treat them in a special way to keep them from crumbling? Wow what beautiful dried flowers! I would love to have that book to add to my collection as well.